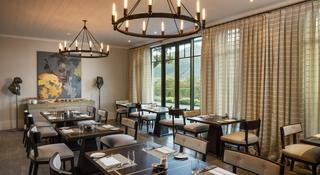 This conference hotel is situated in the heart of Franschhoek winelands on The Fransche Hoek Wine and Olive Estate. The exclusive hotel offers a sanctuary for the soul with its breathtaking view of the surrounding mountains, quaint cobbled streets, vibrant piazza and indigenous Fynbos landscape. 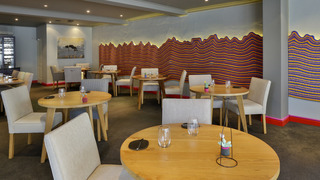 Guests will experience a unique and unforgettable taste of the Franschhoek country lifestyle. The town centre of Franschhoek is around 1 km away, and restaurants, bars and tourist facilities can be found around 15 minutes' walk away. Cape Town and the beach are around 1 hour's drive away. Cape Town International Airport is some 65 km from the property.The hotel has a sense of old-fashioned community that abounds in this sanctuary, which offers weary city-dwellers the tranquillity and relaxed atmosphere of a five-star hotel. Here, residents can stroll the cobbled streets and meet neighbours and friends for coffee or a chat without the rush. And yet, in the midst of this courteous and kindly village with its vibrant piazza and swimming pools, are superior modern amenities and an unparalleled lifestyle. The hotel, which was built in 2008, offers a total of 57 rooms. Facilities at this air-conditioned establishment include a lobby, 24-hour reception and check-out service, a hotel safe, café, restaurant and conference facilities. Room service, laundry service and a car park are also offered.The villas are spacious and equipped with a full private bathroom with a shower, bath and hairdryer, an open-plan lounge and dining area, a fully equipped kitchen with a fridge, cooker, microwave and tea and coffee making facilities, and a balcony. There is also individually regulated air conditioning in the lounge and all the bedrooms. The bedrooms are beautifully decorated with lovely views. Other amenities include king-size beds, a direct dial telephone, satellite/cable TV, hifi, Internet access, a safe, minibar, washing machine and an ironing set. Located in the world-famous Cape Winelands, the hotel has become one of the most romantic getaways in its class. Capturing the essence of luxury, the impeccably appointed hotel offers unparalleled views of the Franschhoek Mountains and is the perfect setting for a taste of the legendary Cape Wine Routes. Located on the site of one of Franschhoek's original country retreats, this hotel retains its elusive charm with a contemporary Cape Dutch feel. Cape Town International Airport is about 45 km away, George Airport is approximately 400 km and Port Elizabeth Airport is some 800 km from the hotel.The conference hotel offers 63 elegant en suite bedrooms and suites. The premises are air-conditioned and features also include world-class conference facilities, 3 restaurants and a bar, 24-hour reception and check-out services, a hotel safe and a newspaper stand. There is also a child minding service, room and laundry services, a travel desk and transfer shuttle facilities. Internet access is on offer and there is ample secure parking in the car park.Each room has an en suite bathroom with a shower, bath and a hairdryer. Rooms are furnished with double or king-size beds and amenities include a direct dial telephone, satellite/cable TV, Internet access and a safe. There is a minibar and tea and coffee making facilities for added convenience. Air conditioning and central heating are standard features in all accommodation. 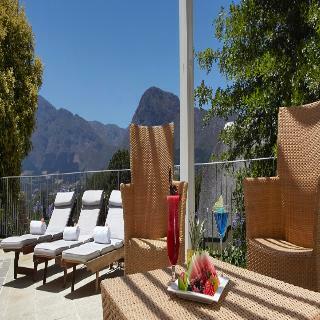 Each room has a balcony overlooking the vineyards, the towering Franschhoek Mountains and landscaped gardens. Set in Franschhoek , this property offers an ideal place of rest and relaxation. Guests can enjoy the convenience of 24-hour reception. Guests can enjoy access to the internet to stay connected to work or home. The property is wheelchair-accessible. The on-site car park may be useful to those arriving by car. Check-out is at . This establishment allows pets. Large pets are allowed at this establishment. Leeu Estates, an exclusive five-star boutique hotel property with 17 luxuriously appointed rooms and suites, takes central position on 68 hectares of vineyards, landscaped gardens and fynbos (indigenous vegetation) in the Franschhoek valley. Located between the mountainside and river, just minutes away from the village of Franschhoek, it is the ideal setting for an elegant and sophisticated private hideaway, offering superb comfort, fine dining and platinum service. At the centre of this working wine farm is the meticulously refurbished 19th-century Manor House with its six rooms and suites. There are two rooms adjacent to The Manor House, and the remaining rooms and suites are located in spacious cottages among the gardens, oak trees and vineyards. Perfect position with fantastic views of the mountains. The staff were excellent and nothing was too much trouble for them. Excellent breakfast , and good food served on the terrace.